…or good evening. That is Damara, one of the coolest languages on earth. Greetings from Windhoek, Namibia. I will not blame Africa for not writing anything lately – I have simply had too many things to write about. However, my friend urged me to write something ages ago, so from now on I will get over myself and tell you about white Afrikaans hipsters, Katutura, lost-in-translationesque shopping Malls and Thor. For now I will settle for telling you that I have almost learned to answer when my housemates say “matisa?” (how are you?). The answer is “!ái a”. Now, this is in Xhosa, which is not as cool as the Khoisan languages like Damara, but it will have to do. Sorry folks, the blog is intellectually under construction. Happy Walpurgis. While waiting, take a look at this. The shiz, yo. And although I never thought I would say these words, Elijah Wood is fantastic. Fantastic. Ok, George Michael’s official channel videos don’t work in Finland. Very disappointing. Maybe this works? Lecturer: I know I was also supposed to bring a piece of music that I really dislike, but I must have taken the cd to the Salvation Army when I moved to Australia. Anyway, have you heard of Yanni? I then realize that everyone in the class is staring at me with blank expressions on their faces. Nobody’s laughing. Lecturer: Oh, it must be a European thing. The Waits clip reminded be of this. “You are not Reagan and I am not Gorbachev.” Gotta love Serge. Today I was reminded of how great Tom Waits is. Hadn’t listened to him in a long time. Will spend evening with Small Change. 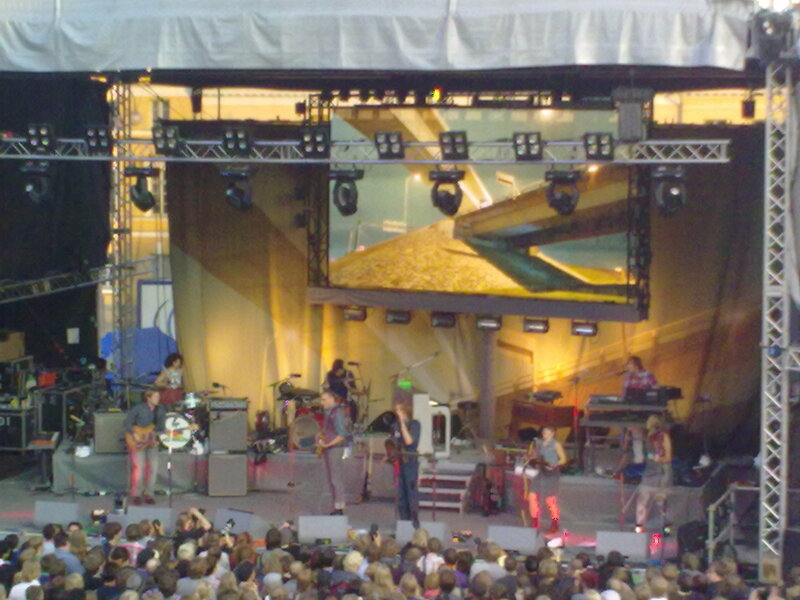 The Arcade Fire played a gig in Helsinki on monday – right smack in the middle of the city in front of the Helsinki Cathedral. It was a beautiful summer evening and they were fantastic. Sometimes I think that their music can be a bit pompous in large doses, but not this time.I remember seeing them 2007 in Roskilde (the rainiest Roskilde ever), freezing and wondering if it was worth it. It was, but this was waaaay better. They had been in Helsinki for a couple of days, and because of Midsummer Helsinki was, according to Win Butler, “a ghost town”. He’s probably right, the city empties for Midsummer when everyone goes to the country. Anyway, can’t wait for the new album. Another blurry gig photo, I know. Will stop posting them in the near future, promise. 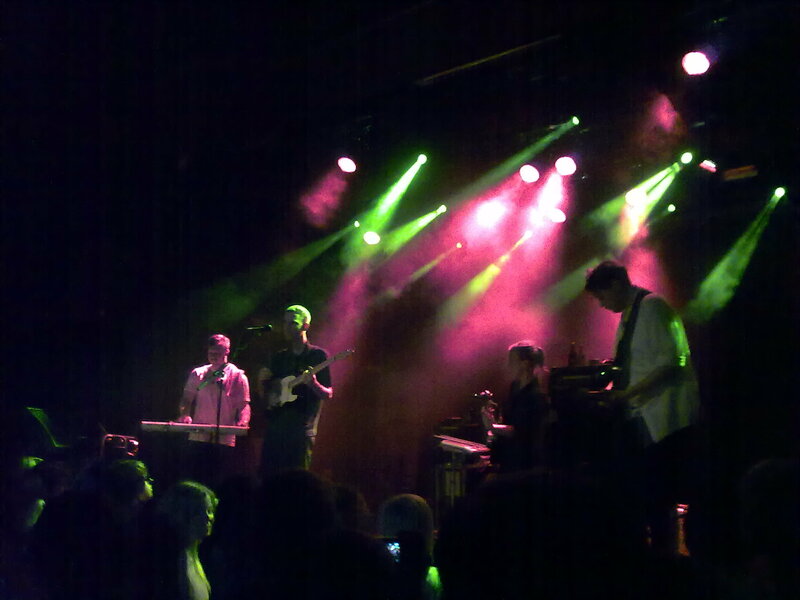 Saw the Radio Dept. yesterday. Nice gig, but a bit weird. I couldn’t make up my mind if they were shy, bored or just shoegazing. It’s that kind of music, I guess, but a bit of contact with the audience wouldn’t hurt. One of the guys looked like a Swedish hipster-version of Alfred Molina and another moved a bit like the guys in A Night at the Roxbury.